FThe FIT UP! fitness studio has been established with the aim of creating high-quality conditions for youth and adults to exercise mainly with strength-training and cardio equipment. It is equipped with reliable machines of different technical difficulty, from simple strength training machines to Technogym electric treadmills. All fitness machines and equipment have been certified in the European Union. Clients perform all sports activities in the studio on their own responsibility. Sport equipment in the fitness studio may be used without supervision only by persons aged 15+. At the client’s request, the manager of the establishment, their deputy, sports assistant or personal trainer, can explain to the clients how to use and operate all equipment, inform them about any potential contraindications and health risks associated with the use of such equipment and suntan studios. In the event of any uncertainty or doubts, or in the case of regular drug consumption, clients are obliged to consult their health condition with their attending physician, and an authorized FIT UP employee is authorized to ask such physician for approval. Clients may enter the facility only with a valid membership card, day card, single entrance or MultiSport card. The opening hours are 6:00 – 00:00. The opening hours may be modified during bank holiday days, whereby clients will be notified thereof at reception and on social media. –	Clients are obliged to wear appropriate training clothes and clean sports shoes, the soles of which may not leave any markings on the floor. –	Clients change their clothes in separate changing rooms and they leave their clothes in designated lockers. –	It is prohibited to enter the training area or showers in shoes used outdoors. –	It is mandatory to use towels in the FIT UP studio. Towels are necessary particularly as a mat when using the equipment as protection against dirt caused by sweating. –	It is necessary to clean the equipment after use with the prepared disinfectant. –	Clients are obliged to return all weights, barbells and other equipment in the FIT UP! studio to its original place after use. –	Soap and other body wash products may be used only in the shower areas. Wash basins serve only for the washing of hands. –	Activities related to intimate hygiene (shaving, depilation) may not be performed in the FIT UP! studio. –	When clients or customers have been injured when performing their activities, there is a first aid kit available in accordance with the Decree of the Ministry of Health of SR No. 554/2007 Coll. The injured part must be immediately rinsed with water, disinfected with wound disinfectant (Septonex, Detol, Mezosept, etc.) and an individually packed sticking plaster must be put on the wound. –	Clients undertake to refrain from making disturbances and to act in a manner not restricting or harassing other visitors and employees of the FIT UP! studio. –	Clients undertake not to enter the FIT UP! studio for any commercial purposes, in particular for providing personal supervision or consultancy to other users or visitors of FIT UP! when using services for payment or for the purposes of similar services without a special contract with the provider. During their presence in the FIT UP! studio users are entitled to use lockers for storing their personal belongings. To use the lockers, users are entitled to use a padlock which they must get at their own cost. At the request of any user, the provider is obliged to lend them a padlock to be used for the locker for a fee amounting to € 0.50 per 1 padlock. In the event of any loss, damage, destruction or failure to return the borrowed padlock, the user is obliged to pay a fee amounting to € 5 for each piece of such lost, damaged, destroyed or unreturned padlock to the provider. Before leaving the FIT UP! studio users are obliged to empty their locker and leave it unlocked for further use, otherwise the provider is entitled to open the locker after the end of the opening hours and to store its contents at the risk and cost of the user. The user is obliged to pay a fee to the provider amounting to € 5 for each day of storing the content of the locker and the provider is obliged to give the stored content of the locker to the user only providing that the user has demonstrated their ownership or other right to the content of the locker and after payment of the full fee for storing the content of the locker. The provider is not liable for any loss, theft, damage or destruction of any users´ items stored in lockers. Similarly, the provider is not liable for any loss, theft, damage or destruction of any users´ items stored outside the lockers. Visitors are obliged to follow the FIT UP! rules of operation and the safety and fire-prevention regulations. Clients must not do anything that is contrary to good manners or to maintaining safety, calm and order. It is prohibited to perform sport activities without a T-shirt or firm sports shoes. –	entry of persons younger than 15. 1)	User identification is necessary during the purchase of a day card for the purposes of any subsequent return of the day card fee when a service provision contract is entered into within 14 days. 2)	User identification is necessary when a free-entry voucher is being used to prevent it from being used repeatedly (every user is entitled to use a free-entry voucher in the FIT UP! network only once). The facility is cleaned and ventilated intensively every day, before or after the opening hours, while efficient artificial ventilation is also working in exercise rooms. Due to long opening hours, hygiene areas are cleaned twice during opening hours and, if necessary, also immediately. Cleaning aids are stored separately from the operational areas in a separate room. Dust bins for small waste are equipped with covers and single-use PVC bags and they are emptied, cleaned and disinfected daily. Floors throughout the entire facility are vacuum-cleaned and cleaned daily; windows, doors and lighting bodies are cleaned twice per year. Basic repair of all coats and paints in operational areas is performed at least annually. Wet mechanical cleaning and disinfection of floors, tiles and personal hygiene facilities is performed daily, before or after the opening hours and continuously as necessary. 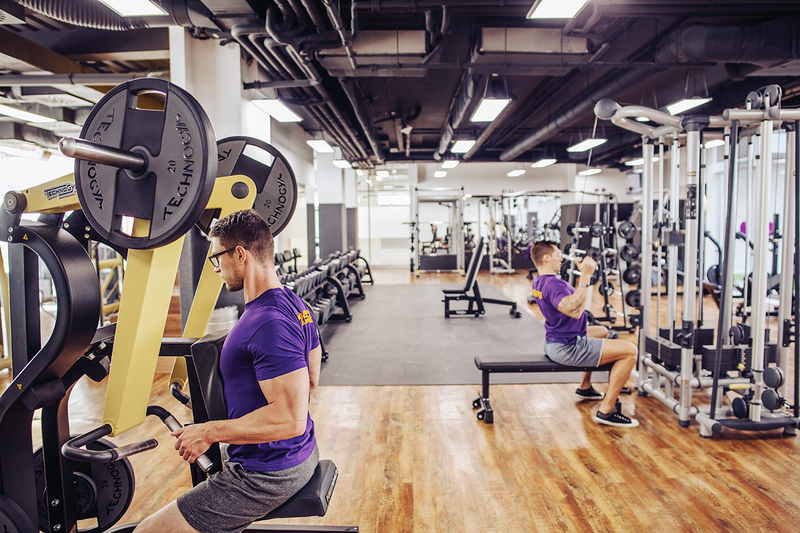 All fitness machines and equipment which come into direct contact with clients’ bodies are cleaned of sweat after each use, treated with a disinfectant or rinsed with warm water and dried with a paper towel. –	cleaning and disinfection of fitness machines and equipment – daily. At least two suitable preparations on different bases are used for the disinfection of floors, tiles and personal hygiene facilities, e.g. SAVO and INCIDUR. Disinfectants are varied weekly to prevent pathogenic microorganisms from becoming resistant to them. Solutions of individual disinfectants are prepared daily. Correct concentration and acting times are observed. The performed disinfection must be without any evidence of the presence of pathogenic microorganisms. Disinfection is always preceded by wet mechanical cleaning with warm water and a cleaning agent. The FIT UP! rules of operation approved by the Regional Office of Public Health with its registered office in Trnava are going to be made available at a visible place at the monitored entry to the facility. The manager of the facility or their deputy who have been appointed by the operator are liable for compliance with the rules.